Washington, DC, is a great city for engagement photography. For DC wedding photographers like us, it is so easy to create unforgettable images of fiancés in the Nation’s Capital. The District of Columbia is filled with so many famous buildings, memorials and monuments. Using those DC icons in engagement photos leads to couples portraits that are beautiful and distinctly Washington. Brides and grooms getting married in Washington, DC, love how the Washington Monument, Lincoln Memorial or Washington National Cathedral enhance their engagement photos. Those DC landmarks are instantly recognizable in photographs and give the fiancés’ betrothal images a sense of time and place. Washington is not the only city with iconic buildings that look great in engagement pictures, of course. In our opinion as DC wedding photographers, something else makes it such a great location. We love the District of Columbia for engagement photo shoots because there are so many beautiful spots in the city. Future brides and grooms can also pose on the steps of the US Capitol or in front of the White House, of course. But spouses-to-be can also have their pre-wedding photo shoots in parts of Washington that are lesser known but no less iconic. A Washington, DC, wedding photographer can take pictures of fiancés strolling along the Potomac River on the Georgetown Waterfront. Meridian Hill Park in Northwest Washington has a cascading fountain that looks fantastic as a backdrop in couples portraits. Ben’s Chili Bowl on Washington’s famous U Street Corridor gives engagement images a fun and offbeat look. There are so many out-of-the-way places that still give pictures of spouses-to-be a Washingtonian feel. And then there are the Smithsonian Institution’s network of museums spread across downtown DC. The National Mall alone is home to eleven buildings that preserve different parts of American history and culture. Each has its own distinct style and offers a uniquely compelling backdrop for engagement photography. The Smithsonian Castle has its famous spires. The National Museum of Natural History has its golden dome. The National Museum of African American History and Culture has its inverted-pyramid architecture. Entry to all is free to the public. Couples portrait sessions in and around these museums are allowed. Not surprisingly, this makes those buildings popular sites for DC engagement photography. That and the fact that they give images of fiancés embracing a particularly DC feel! The Smithsonian also has five other museums (and the National Zoo) located in other parts of the Nation’s Capital. We have taken DC engagement portraits in many of them and always loved the results. One of our favorite locations is The Smithsonian American Art Museum. It shares a building in Penn Quarter with the National Portrait Gallery — another Smithsonian museum. The American Art Museum showcases the extraordinary range and diversity of the art produced by Americans. 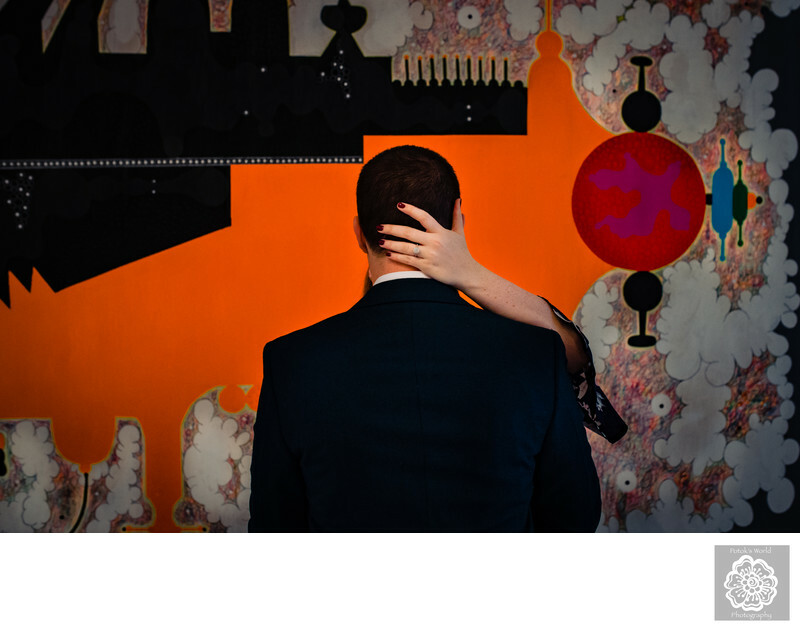 We love about the American Art Museum because it allows a more creative and nontraditional take on DC engagement photography. The installations housed in the building are colorful and interesting. They encourage a Washington, DC, wedding photographer to find new and different ways to pose future spouses. We posed this bride- and groom-to-be in front of a giant photo of the moon, for example. We also took engagement pictures of them with this gloriously colorful and unique installation in the background. The results speak for themselves, in our opinion. Location: National Portrait Gallery, 8th St NW & F St NW, Washington, DC 20001.